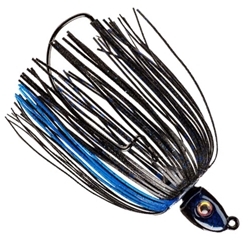 The Strike King Tour Grade Swinging Swim Jig was designed to help you catch more fish. It includes a streamlined painted balanced head for better swimming action and is coordinated with the awesome Perfect Skirt. It's main feature is a free swinging black nickel needlepoint hook for that maximum action in the water. Add you favorite RageTail or swimming Perfect Plastic bait trailer and hang on!